How can you tell if your summer lawn is stressed from drought, insect and disease damage, or improper maintenance? If you’re wilting from the summer heat, chances are your lawn is too. Even though we had heavy rains this spring, temperatures now are soaring and rainfall has become more scarce. Our soils will dry out quickly, leaving your lawn more thirsty than you may think. Chinch bugs in a Dallas lawn. Push a screwdriver into the soil in various areas of your lawn. If it pushes easily into the soil 5-6 inches deep, and soil seems moist, you’re good. However, if you can’t push the screwdriver that far into the soil, it may be dry and heavily compacted. If brown patches in the lawn don’t pull out of soil easily at the roots, then the grass is most likely brown due to drought, not Brown Patch disease. If there are areas of your lawn lush and green, especially near a sprinkler head, but there are other areas that are turning brown, then it could be that your irrigation is not reaching all zones of the landscape. Now could be the time for an irrigation check up. Insects will attack weakened lawns due to drought stress. Right now, summer lawn pests include chinch bugs, grubs and armyworms. Healthy soil full of beneficial predators will keep many lawn pests at bay. Have you pulled up patches of brown grass easily only to find hardly any root system? Could be an infestation of grubs below the surface. Learn about grubs HERE. 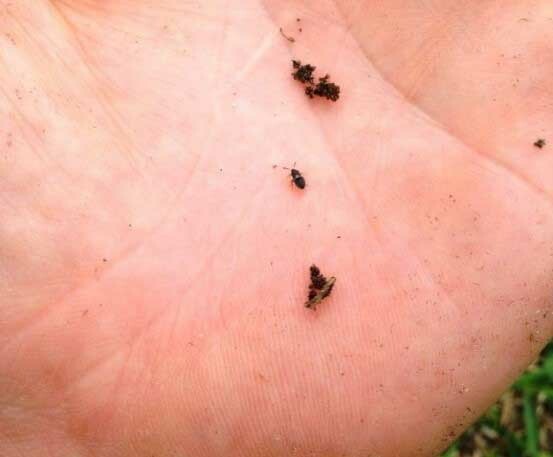 Chinch bugs are most common in St. Augustine lawns, but they can also damage Bermuda and Zoysia lawns. You could have chinch bug damage if you notice yellowing on the edges of grass blades that eventually brown out in large swaths, especially when you notice the damaged areas are closest to driveways and sidewalks where the temps are warmer. Can lawns go into summer dormancy? Did you know that lawns can go dormant in both cool and warm seasons? To protect itself from heat and drought stress, you lawn can go to “sleep” in summer, reducing the need for nutrients and water. If your lawn turns brown due to lack of water in summer, it’s possible it may green up again in fall once temperatures cool and rainfall returns. However, some of the root system may be damaged and this could leave your lawn more susceptible to cold damage in winter. To bring grass out of dormancy, it could take up to three weeks of consistent moisture and a boost of liquid compost extract or other organic nutrient to come out of dormancy. When you recognize the signs of stress, then you are ahead of the game and can begin to adjust your watering and maintenance regimen. Ready to begin your organic soil building plan that will help to grow a beautiful lawn and landscape? Contact us this summer.